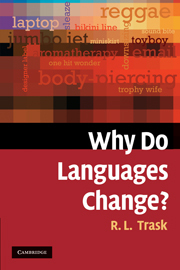 Home > Catalogue > Why Do Languages Change? The first recorded English name for the make-up we now call blusher was paint, in 1660. In the 1700s a new word, rouge, displaced paint, and remained in standard usage for around two centuries. Then, in 1965, an advertisement coined a new word for the product: blusher. Each generation speaks a little differently, and every language is constantly changing. It is not only words that change, every aspect of a language changes over time - pronunciation, word-meanings and grammar. Packed with fascinating examples of changes in the English language over time, this entertaining book explores the origin of words and place names, the differences between British and American English, and the apparent eccentricities of the English spelling system. Amusingly written yet deeply instructive, it will be enjoyed by anyone involved in studying the English language and its history, as well as anyone interested in how and why languages change. 1. How do languages change? ; 2. Why are languages always changing? ; 3. Where do words come from? ; 4. Skunk-Leek – my kind of town: what's in a name? ; 5. Where does English come from? ; 6. Why is American English different from British English? ; 7. Why is English spelling so eccentric? ; 8. Which is the oldest language?